re.mow is a new cordless rotary mower offering premium quality at a very good value price. Powered by a 24v rechargeable battery, this mower can tackle lawns up to 300m2 on a single charge. The re.mow REME01 has many premium quality features including single central cutting height adjustment and a LED display which constantly shows the charge remaining in the battery making sure that you never run out of power during a cut. The 36cm/14.4 inch cutting width blade has an operational speed of 3000rpm, the highest speed of any mower in its class. 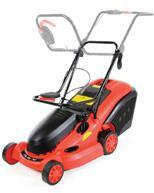 This blade speed ensures a clean cut of the grass as well as efficient grass collection. The grass collector has been specially designed for optimum air flow and has a 50 litre capacity. The re.mow REME01 is simple to transport with quick release folding handles and recessed handles built into the side of the deck to allow easy lifting or to tilt the mower for under deck cleaning. The folding handles reduce the size of the mower, ideal for those who have limited space. re.mows sensational performance are is not by chance. 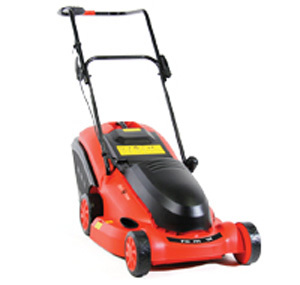 This British designed and engineered mower is the result of a lengthy research and development process. The battery and the motor have been specifically paired to give a better cutting performance and longer cutting time than other cordless mowers. Delivery of this item is FREE to mainland UK addresses (Highlands and Islands extra). When in stock, delivery normally next working day, if order process before 12.00 noon, but please allow three working days.